If Facebook were a publicly traded company, its market value would rival Yahoo’s and be ten times bigger than AOL’s, if demand for its private shares are any indication. Shares of Facebook on private-company stock market SecondMarket are going through the roof right now. This week, Facebook shares traded on SecondMarket passed $50, giving Facebook a total market value of $25 billion, according to sources with access to the market. (SecondMarket itself does not disclose pricing or valuation of the private stocks it trades). 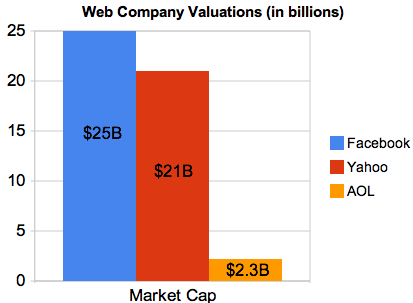 In comparison, Yahoo’s market cap on the publicly traded stock market is currently $21 billion, while AOL’s is $2.3 billion. These aren’t apples-to-apples comparisons because SecondMarket is a private stock market with thinly traded shares where demand often outstrips supply. (By definition, private stock sales trade in an illiquid market). But it is a real market with buyers and sellers, and right now that market is putting a $25 billion value on Facebook. 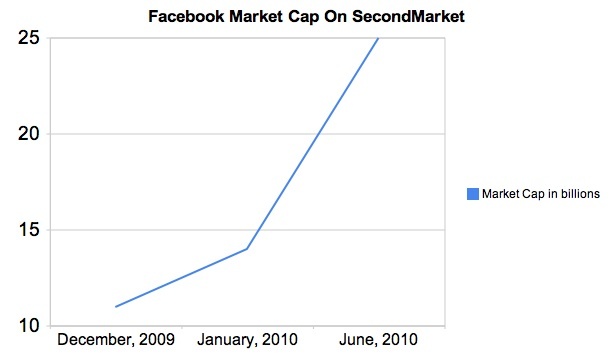 The last time we checked in on how Facebook’s shares were doing on SecondMarket was in January, 2010 when the company was valued at $14 billion (which was up from $11 billion the month before). Back in August, 2009, DST was buying back common shares at a $6.5 billion valuation, so that’s been an incredible rise in value over the past year. Even Microsoft’s $15 billion valuation (albeit for preferred shares) does not seem so crazy anymore in light of what investors are paying on SecondMarket. Last week at TechCrunch Disrupt, SecondMarket’s chief strategy officer Jeremy Smith explained how the market works to Beet.TV, and that so far a total of about $100 million worth of Facebook stock has been traded through SecondMarket (watch the video).